Did you know that (ex) service personnel make some of the best project managers? You have the leadership, team building and organisational skills to suceed in this kind of role. You can gain the qualifications necessary for this using the Enhanced Learning Credits (ELC) scheme. The MOD's Enhanced Learning Credits Scheme is an initiative to promote lifelong learning amongst members of the Armed Forces. 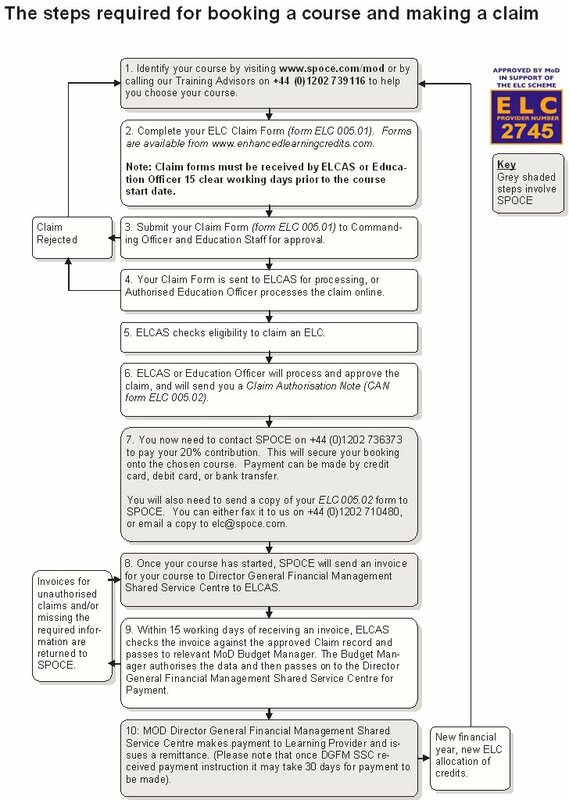 SPOCE is registered with this scheme and can provide accredited training that works with the ELC. We are passionate about helping our (ex) service personnel embarking on their 2nd careers which is why we have a specific pricing scheme put together especially for our ELCAS candidates. “I don't have the experience” is something that we hear time and again from service leavers. We believe you do have the experience. Perhaps you need to give some thought to the “projects” you have managed during your service (e.g. arranging the Mess Summer Ball, the Summer Fair, or the Christmas Draw). Gaining a certificate in PRINCE2® or APM will put you in a stronger position to secure job interviews. It will be ten times more difficult to secure an interview without a project management certificate. It is the inter-view that will give you the opportunity to explain the experience that you have. When looking to start your career in project management, consider your experience, and match this to the different roles in project and programme management. Programme Manager - Manages large change initiatives; coordinates many projects. Business Change Manager - Ensure new capabilities are embedded to achieve benefit. Project Manager - Coordinates work to manage the successful delivery of products. Project Coordinator/Asst Project Manager - Assisting with maintaining project logs and registers; creating reports and other documentation. Project Support - Provides administrative support to the project teams. The course you choose largely depends on the career you wish to pursue. While we cannot choose the course for you, we can certainly give good advice on training for your future. What makes you choose the right training provider? And better still, you have the assurance of knowing that when you leave the training course, you will understand what you have been taught. Because being the World’s first accredited training organisation in both PRINCE2® and MSP® ensures we have the experience, knowledge and commitment to meet your requirements. 5 Day Foundation and Practitioner CLASSROOM £250/- £1000/- This 5 day event includes: PRINCE2 Manual, Online Event Preparation Materials, Foundation & Practitioner Exams, Course Handouts, Lunch & Refreshments. On-site accommodation available (except london) for £75/night. Online Foundation and Practitioner ONLINE £150/- £600/- This package includes: Online PRINCE2 Passport eLearning, PRINCE2 Manual and Foundation & Practitioner Exams. Online Foundation and Practitioner BLENDED £200/- £800/- This package includes: Online PRINCE2 Passport eLearning, PRINCE2 Manual, Foundation & Practitioner Exams, plus a 1-Day Classroom Exam Preparation Workshop. On-site accommodation available (except london) for £75/night. ONLIVE Virtual Classroom Foundation Virtual Classroom £119 £480 This package includes: Live and interactive trainer sessions that are acccessed remotely from almost any device. Online PRINCE2 event prep, PRINCE2 Manual and Foundation Exam. ONLIVE Virtual Classroom Foundation & Practitioner Virtual Classroom £259 £1040 This package includes: Live and interactive trainer sessions that are acccessed remotely from almost any device. Online PRINCE2 event prep, PRINCE2 Manual and Foundation & Practitioner Exams. Online Practitioner ONLINE £150/- £600/- This package includes: Online PRINCE2 Agile Passport eLearning, PRINCE2 Agile Handbook and Practitioner Exam. 5 Day Foundation and Practitioner CLASSROOM £250/- £1000/- This 5 day event includes: MSP Manual, Online Event Preparation Materials, Foundation & Practitioner Exams, Course Handouts, Lunch & Refreshments. On-site accommodation available (except london) for £75/night. Online Foundation and Practitioner ONLINE £150/- £600/- This package includes: Online MSP Passport eLearning, MSP Manual and Foundation & Practitioner Exams. Online Foundation and Practitioner BLENDED £200/- £800/- This package includes: Online MSP Passport eLearning, MSP Manual, Foundation & Practitioner Exams, plus a 1-Day Classroom Exam Preparation Workshop. On-site accommodation available (except london) for £75/night. 3 Day Foundation CLASSROOM £160/- £640/- This 3 day event includes: Agile Project Management official handbook, Foundation Exam, Course Handouts & Refreshments. 4 Day Foundation and Practitioner CLASSROOM £250/- £1000/- This 4 day event includes: Agile Project Management official handbook, Foundation & Practitioner Exams, Course Handouts & Refreshments. Online Foundation and Practitioner BLENDED £200/- £800/- This package includes: Online Agile Passport eLearning, AgilePm Handbook, Foundation & Practitioner Exams, plus a 1-Day Classroom Exam Preparation Workshop. On-site accommodation available (except london) normally for £75/night. 5 Day APM - PMQ Project Management Qualification (APMP) CLASSROOM £400/- £1000/- This 5 day event includes: APM Body of Knowledge - Edition 5, Pre-course Study Guide & Event Preparation Materials, APMP Exam, Course Handouts & Refreshments. 5 Day APM - PMQ for PRINCE2 Practitioners CLASSROOM £250/- £1000/- This 5 day event includes: APMP for PRINCE2 Practitioners book, Pre-course Study Guide & Event Preparation Materials, APMP Exam, Course Handouts, Lunch & Refreshments. On-site accommodation available (except london) for £75/night. 3 Day Foundation CLASSROOM £160/- £640/- This 3 day event includes: Management of Risk (M_o_R) Manual, Pre-course Study Guide & Event Preparation Materials, Foundation Exam, Course Handouts & Refreshments. On-site accommodation available (except london) for £75/night. 5 Day Foundation and Practitioner CLASSROOM £250/- £1000/- This 5 day event includes: Management of Risk (M_o_R) Manual, Pre-course Study Guide & Event Preparation Materials, Foundation & Practitioner Exams, Course Handouts & Refreshments. On-site accommodation available (except london) for £75/night. 3 Day Foundation CLASSROOM £160/- £640/- This 3 day event includes: Portfolio, Programme and Project Offices (P3O) Manual, Pre-course Study Guide & Event Preparation Materials, Foundation Exam, Course Handouts & Refreshments. On-site accommodation available (except london) for £75/night. 5 Day Foundation and Practitioner CLASSROOM £250/- £1000/- This 5 day event includes: Portfolio, Programme and Project Offices (P3O), Pre-course Study Guide & Event Preparation Materials, Foundation & Practitioner Exams, Course Handouts & Refreshments. On-site accommodation available (except london) for £75/night. 3 Day Foundation CLASSROOM £150/- £600/- This 3 day event includes: ITIL Foundation Handbook, Event Preparation Materials, Foundation Exam, Course Handouts & Refreshments. On-site accommodation available (except london) for £75/night. 3 Day Foundation CLASSROOM £160/- £640/- This 3 day event includes: Management of Portfolios (MoP) Manual, Event Preparation Materials, Foundation Exam, Course Handouts & Refreshments. On-site accommodation available (except london) for £75/night. 5 Day Foundation and Practitioner CLASSROOM £250/- £1000/- This 5 day event includes: Management of Portfolios (MoP) Manual, Event Preparation Materials, Foundation & Practitioner Exams, Course Handouts & Refreshments. On-site accommodation available (except london) for £75/night. 2 Day Foundation CLASSROOM £160/- £640/- This 2 day event includes: Management of Value (MoV) Manual, Event Preparation Materials, Foundation Exam, Course Handouts & Refreshments. On-site accommodation available (except london) for £75/night. 4 Day Foundation and Practitioner CLASSROOM £250/- £1000/- This 4 day event includes: Management of Value (MoV) Manual, Event Preparation Materials, Foundation & Practitioner Exam, Course Handouts & Refreshments. On-site accommodation available (except london) for £75/night. 3 Day Foundation CLASSROOM £160/- £640/- This 3 day event includes: Joining instructions and pre-course preparation pack, Official manual 'Making Sense of Change Management', Printed course material, Foundation Exam & Refreshments. 5 Day Foundation and Practitioner CLASSROOM £250/- £1000/- This 5 day event includes: Joining instructions and pre-course preparation pack, Official manual 'Making Sense of Change Management', Printed course material, Foundation & Practitioner Exam and Refreshments. To help maximise your learning credits SPOCE has offer a number of combination courses that can be used in the same claim. Not only do the combi-courses ensure that you use your full ELC, but you get better value on the course pricing too. The simplest example of a combi-course is for you to choose any two 5-day Practitioner courses from our range of PRINCE2, MSP. APMP, P3O, MoV or MoP. Or you might look at covering a wider range of subjects by taking Foundation level courses or online learning. You can combine any number of courses. If you are looking to combine three or more courses, you should be aware that your contribution will need to cover the costs over and above the £2,000 ELC (your individual contribution must cover at least 20% of the total cost). If you have a specific combination in mind, then please call our ELC Advisors on +44 (0)1202 739116 and they will help you with your selection and claim. This course combination is perfect for individuals who are look-ing at gaining the skills and qualifications to become a fully rounded project manager. It includes the process driven frame-work of PRINCE2 (What, When, Why, Who), coupled with the APMP Certificate (How) based on the APM body of knowledge. This course combination is aimed at project managers and de-velopers who are looking at confirming their project manage-ment experience with formal qualifications. PRINCE2 providing the de facto process-driven method, and PRINCE2 Agile® providing a more flexible approach with focus on time and cost. 1. Can I combine more than one course? Yes. SPOCE can combine any number of course titles. This means that you can use your full allowance to book 2 or more courses under one claim. 2. Are combination courses set or can I mix and match? 3. Do courses need to run sequentially and be within a set period? 4. If I book 2 courses, do I have to attend the same venue? No. You have a choice of any date and venue to choose from the SPOCE public schedule. 5. Can the accommodation costs be separated from the course costs? 6. Can food costs be separated from course and accommodations costs? 7. Can receipts for the above be billed to the candidate? 8. Can the cost of the combination courses be expanded over a two different ELC credit periods? 9. What are SPOCE pass rates? 10. Will I get penalised if I am sent on deployment at short notice and therefore need to change course dates? 11. Do I have to book courses through the CTP? No. You can book directly through SPOCE. 12. If I don’t book courses through the CTP but use my ECL credits will I get the same price as CTP price lists? 13. Where can I find further information? You can either call SPOCE on +44 (0)1202 739116, Request a CallBack or email info@spoce.com. Alternatively, full details can be found by visiting the Enhanced Learning Credits Administration Services page.